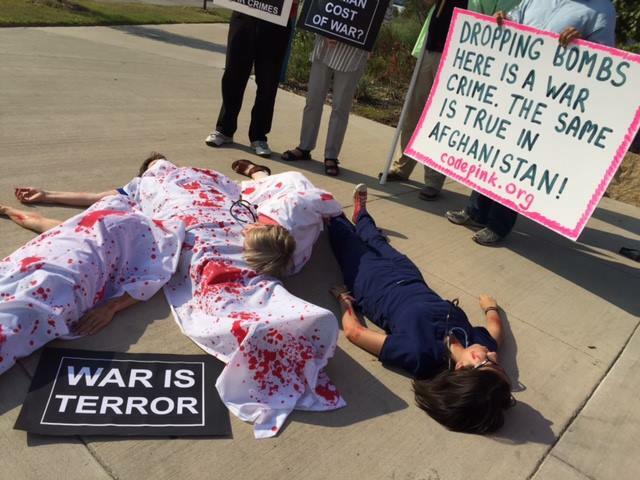 Humanitarian activists staged a 'die-in' in front of Parkland Memorial Hospital in Dallas, calling for an independent investigation into the bombing of a MSF hospital in Kunduz, Afghanistan. Portland, Maine –– Citizens disgusted by the U.S. bombing of a Doctors Without Borders hospital in Kunduz, Afghanistan will protest on Saturday, October 10 in front of Mercy Hospital at 5:00pm. Some protesters plan to wear scrubs to highlight the fact that staff of the hospital were killed and injured during more than 30 minutes of bombing. Patients, including children, were also burned to death or otherwise injured during the air strike on the only free trauma hospital in the region. Doctors Without Borders has since announced that it is withdrawing from Kunduz, possibly from all of Afghanistan. The action in Portland is part of a national wave of protests. In Washington DC on Oct 6 before the start of a Senate Armed Services Committee hearing about Afghanistan, Dr. Margaret Flowers was arrested for speaking out against the recent US bombing of a Doctors Without Border hospital in Kunduz, Afghanistan. Dr. Flowers was holding a sign which read “BOMBING HOSPITALS= WAR CRIME”. Dr. Flowers, a pediatrician and candidate for the U.S. Senate seeking Sen. Barbara Mikulski’s seat, was with members of the peace group CODEPINK at the hearing who were wearing “bloodied” doctors garb with “bloody” hands to draw attention to the culpability of hearing witness General John Campbell, who is responsible for U.S. forces in Afghanistan. The protesters were also calling for a U.S. commitment to rebuild the hospital, provide health care for the injured parties and compensate the families of the deceased. They delivered a petition to General Campbell signed by over 5,000 members of CODEPINK. For more information on the Oct. 10 protest at Mercy Hospital in Portland, Maine contact CODEPINK Local Coordinator Pat Taub, 207-542-7119, pparee2011@gmail.com.